﻿	Alpha Stamps News » A Haunted Halloween Surprise Box by Kristin Batsel! A Haunted Halloween Surprise Box by Kristin Batsel! I love this mash-up of the Double Explosion Box from the July kit with this month’s Halloween theme! But beware! This is not an ordinary box, it’s an exploding box straight from Alpha Stamps. Once you lift the lid, the sides of the box slowly open, and you see exactly what’s doing the haunting. Yikes! It appears to be a forgotten cemetery, and one of the grave’s occupants seems to be clawing his way up from underground. I cut those hands off of an unfortunate plastic skeleton. The chipboard tombstones were painted in mottled black, grey and white acrylic paints, and then embellishments were added: a silver medal flower on the cross, some rub on scrolly lines and a painted RIP on the rounded stone, and a silver skull charm, also painted, on the pointed headstone. Some tiny bats, cut out of a chipboard border, fly overhead. A spooky skull has also made an appearance. Read more in Kristin’s blog post. And/or see her supply list (plus check below in the Giveaway for another photo and a special drawing prize)! Tons of Dresden Trims Back in Stock! Hooray for the Halloween Essentials Giveaway! Here’s that promised photo showing Kristin’s Haunted Halloween Surprise Box all closed up (and decorated so fancy)! There’s a special Giveaway today: one of the Vintage Halloween Collector’s Essential Kits! The 12×12 plaid scrapbook paper in it is very close to the plaid Kristin used on her box. - one 6″ x 12″ sheet of chipboard stickers (37 pieces). More photos are on the Vintage Halloween Collector’s Essential Kit page. BONUS: just cuz I love them so much: I’m also including one of the new Black Ouija Board Planchette Pendants! To enter the Halloween Essentials Giveaway drawing all you have to do is leave a comment BELOW on this blog post TODAY or TOMORROW (the deadline is 11:59 pm PST, Monday Night, September 10, 2018). Hey, who won the Nature’s Anthology Giveaway from Thursday’s newsletter? That would be Rebecca R! Congrats! Check your email for info. September 9th, 2018 at 6:04 am. September 9th, 2018 at 6:36 am. The little Ouija Board is adorable. I love Halloween and would love the chance to win. September 9th, 2018 at 6:39 am. Rhe wrapped box is so pretty, love it! And the wonderful surprise inside is awesome! September 9th, 2018 at 6:43 am. Love the way she wrapped the box! September 9th, 2018 at 6:45 am. Love that little Ouija board planchette! September 9th, 2018 at 6:46 am. Oh! I LOVE exploding boxes. This would be so much fun!!! WOW! I love everything about this project. Great Halloween project and spooky graveyard. September 9th, 2018 at 6:50 am. OMG THAT IS SO WONDERFUL. I would put it with my cemetery project. It would fit perfect. September 9th, 2018 at 6:51 am. Halloween exploding box awesome idea. September 9th, 2018 at 7:05 am. that is the perfect idea for a little cloche. Thank you. September 9th, 2018 at 7:06 am. September 9th, 2018 at 7:28 am. I love this Halloween project! I think I would turn the exploding box into a Witch’s Ball. Alpha Stamps had a Witches Ball ATC swap a few years back and I love that theme! Happy Halloween everyone! September 9th, 2018 at 7:31 am. That is so cute I would love make one! September 9th, 2018 at 7:35 am. September 9th, 2018 at 7:42 am. My favorite time of year- The projects are cute and creepie. September 9th, 2018 at 7:43 am. This is really cute. Loves the goodies. September 9th, 2018 at 7:48 am. I love the box! Halloween decorations are the best. I make some every year and send to my sisters and nieces. September 9th, 2018 at 7:54 am. My favorite holiday…what a treat these boxes are…can’t wait to try this technique…thanks for sharing! September 9th, 2018 at 7:58 am. September 9th, 2018 at 7:59 am. Such an awesome box!! Love it!! September 9th, 2018 at 8:01 am. September 9th, 2018 at 8:02 am. September 9th, 2018 at 8:08 am. September 9th, 2018 at 8:10 am. What a fun box! I love all the tiny Halloween goodies! September 9th, 2018 at 8:20 am. OMG, the box is fantastic! But I am crazy about the pendant too! September 9th, 2018 at 8:40 am. I Love this box! !I have been searching all month for Halloween papers seems this year all the paper companies seemed to have forgotten Halloween this year. So sad…This is just what I need to make to cheer me up!! September 9th, 2018 at 8:49 am. September 9th, 2018 at 8:50 am. OMG what an amazing giveaway! Halloween is my fav hope I win! That pendant is to die for! September 9th, 2018 at 9:13 am. Love the planchette, love the box. Inspires me to do a tarot reader’s box for my tarot table at parties. September 9th, 2018 at 9:16 am. September 9th, 2018 at 9:29 am. What a fun Halloween scene! Love Kristin’s project! Halloween is my favorite papercrafting occasion! September 9th, 2018 at 9:30 am. Halloween is so much fun! Lots of great inspiration! September 9th, 2018 at 9:34 am. Love the creativity. Love Halloween! Love to win! September 9th, 2018 at 9:35 am. September 9th, 2018 at 9:37 am. Love the Oujia board planchette and the resin tombstones! Kristin did an amazing job making her Halloween surprise box! It is wrapped up so beautifully! So many little details to See! TFS! Congratulations to Rebecca on winning the last giveaway! Enjoy! September 9th, 2018 at 9:42 am. I have to admit that I was not in love with the explosion boxes….until NOW. This box is so awesome, I now have to make one! Great inspiration. September 9th, 2018 at 9:45 am. 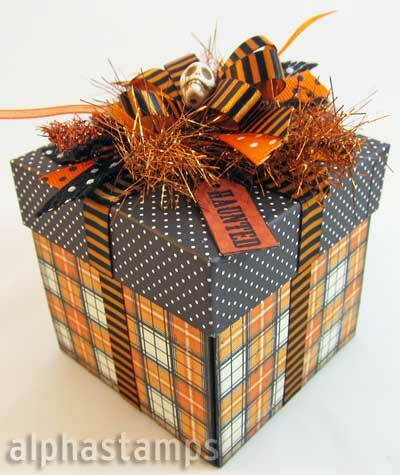 Love the Halloween stuff…wanna make a Halloween explosion box! September 9th, 2018 at 9:50 am. Thanks for a chance to win this beautiful kit! September 9th, 2018 at 10:01 am. I love Halloween so much, my living room is done in Halloween all year long! Yes, I would love all this Halloween stuff! September 9th, 2018 at 10:27 am. Thank you so much guys! Im so excited! :) Its so nice and generous of you to do these wonderful and inspiring give-aways! I am truly so Grateful! Thank You! I love the Ouija charm! So cool! September 9th, 2018 at 10:30 am. Loving all the new Halloween! September 9th, 2018 at 10:46 am. September 9th, 2018 at 10:50 am. 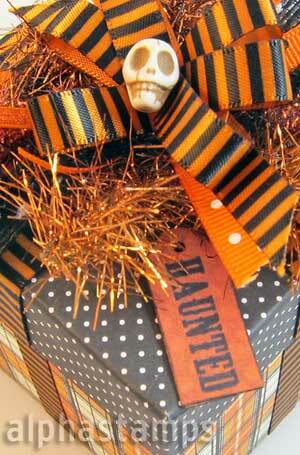 I would love to win this as halloween is my favorite holiday and I love surprise boxes…. September 9th, 2018 at 10:56 am. The Halloween paper collection is Awsome! September 9th, 2018 at 10:57 am. next week. I love Halloween. September 9th, 2018 at 10:59 am. This is so cute?!!!! I love Halloween! September 9th, 2018 at 11:14 am. September 9th, 2018 at 11:20 am. Exploding boxes and Halloween! What a fun project! September 9th, 2018 at 11:38 am. Love Halloween! What a fantastic exploding box and creepy center! September 9th, 2018 at 11:43 am. Hooray for Halloween! What a great use of the exploding box! September 9th, 2018 at 11:57 am. Love, love, love he Halloween box! September 9th, 2018 at 12:00 pm. September 9th, 2018 at 12:01 pm. I always think that Summer is my favorite season, but when Fall comes I love everything about it- especially Halloween. What a delightful project! September 9th, 2018 at 12:19 pm. I love all these ideas and wonder why I can never come up with anything this creative. September 9th, 2018 at 12:26 pm. All I can say is “WOW” what a giveaway. This will make one lucky person very happy. Gorgeous! I wish I were as creative as all these designers! The only way for me to be successful with creativity is to buy a kit and follow instructions! September 9th, 2018 at 12:39 pm. How cute is this. Love all the Halloween items, it is my favorite holiday!!! September 9th, 2018 at 12:50 pm. Such an amazing project! Loving those leaves and looking forward to ours in Michigan being that color! September 9th, 2018 at 12:56 pm. September 9th, 2018 at 1:36 pm. September 9th, 2018 at 2:18 pm. “I LOVE” exploding boxes. This would be so much fun to make. What a great idea. September 9th, 2018 at 2:37 pm. Congrats Rebecca! Love the Halloween kit goodies and the great explosion project. Thank you for one of my favorite give aways this year. September 9th, 2018 at 3:01 pm. Halloween delight! the box is such a fun way to surprise. Would love to win this! September 9th, 2018 at 5:16 pm. Halloween has always been one of my favorite fun times! September 9th, 2018 at 5:27 pm. September 9th, 2018 at 6:01 pm. I absolutely love Halloween!! I think I might just start keeping some of my Halloween decorations out all year. This exploding box is going to be one of them. I just love the ribbon! September 9th, 2018 at 6:02 pm. Loving the Halloween goodies, such cute ideas! September 9th, 2018 at 6:07 pm. I love all of the Halloween goodies. Can’t wait to get started on my ‘spooky’ projects. September 9th, 2018 at 6:18 pm. What a great Halloween “gift!” Love the project, especially the skeleton trying to escape! September 9th, 2018 at 6:20 pm. Great box love the hands coming up. Also love the giveaway-fantastic paper collection. September 9th, 2018 at 6:45 pm. September 9th, 2018 at 7:39 pm. Ohhhhhh! Halloween! It’s the most wonderful time of the year! September 10th, 2018 at 5:16 am. Love making explosion boxes. This is the first Halloween one that I have seen and Love it. September 10th, 2018 at 5:29 am. I’ve never made an explosion box. What a great way to start! September 10th, 2018 at 6:06 am. September 10th, 2018 at 6:11 am. I love Halloween! This explosion box is amazing! I have never done one, but am now thinking I may have to try a Halloween one. September 10th, 2018 at 6:19 am. September 10th, 2018 at 6:30 am. Love it!! I can think of so many cool projects with these images and pages! September 10th, 2018 at 8:15 am. September 10th, 2018 at 9:35 am. WOW! What a great giveaway! I’m a huge Halloween fan and this box of goodies is a dream come true. Thank you for the opportunity! September 10th, 2018 at 10:30 am. September 10th, 2018 at 12:29 pm. Luv the Hlwn surprise box & new Ouija planchette. September 10th, 2018 at 1:54 pm. Love the Halloween paper! Looking for a Fall project to use with my exploding boxes. This one would be a real treat (pun intended)! September 10th, 2018 at 2:51 pm. September 10th, 2018 at 3:21 pm. September 10th, 2018 at 3:27 pm. The Black Ouija Board Planchette Pendant is purrrfect for a Halloween swap I’m in! Love it all!! September 10th, 2018 at 3:59 pm.